An ideal tax system is one that taxes a wide base at a low rate. Unfortunately, the current federal individual income tax system does neither. Thanks to a myriad of exclusions and preferences, the current system taxes just 40 percent of actual income in the U.S. As a result, income tax rates are more than twice as high as they could otherwise be (See complete study here). Figures 1 and 2 below illustrate how various tax provisions have eroded the federal income tax base, requiring higher overall tax rates for all Americans. 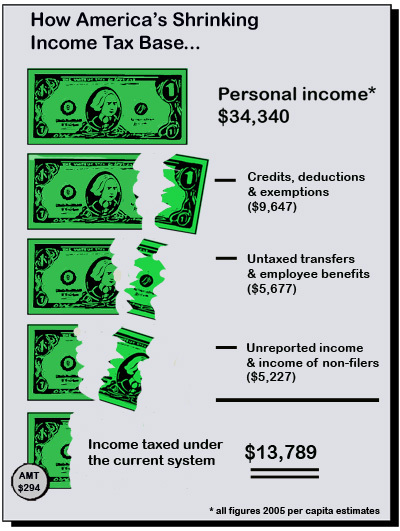 Figure 1 begins with the broadest possible tax base—“personal income” as defined by the Bureau of Economic Analysis—and illustrates how various tax provisions whittle away that base. In 2005 total U.S. personal income is $10.2 trillion, or an estimated $34,340 per capita. From that ideal base, credits, deductions, exemptions and other exclusions carve out the largest portion. These include provisions such as the $1,000-per-child tax credit, the deduction for home mortgage interest and personal exemptions. In total, they shrink the tax base by $9,647 per capita, or 28.1 percent of income. Untaxed transfers and employee benefits take the next largest bite out of the income tax base. These include items such as the value of unemployment benefits, employer provided health insurance and other untaxed income. They reduce the tax base by $5,677 per capita, or 16.5 percent of income. The income of non-filers and unreported income carve out the final portion of the income tax base. These include income earned by those not required to file federal tax returns and criminally unreported income. In total, these shrink the tax base by $5,227, or 15.2 percent of income. Taken together these tax provisions exempt roughly $20,551 per capita from income taxation, shrinking the tax base to just 40 percent of what it could otherwise be. 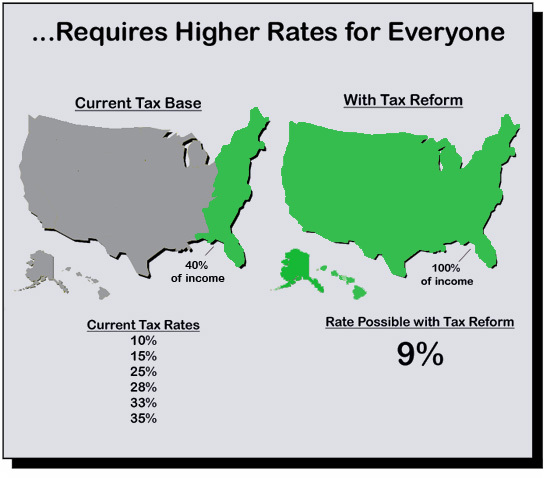 As Figure 2 illustrates, this reduced tax base requires higher rates. The current system requires six tax rates ranging from 10 percent to 35 percent to raise the $912 billion in federal individual income tax revenue expected in 2005. That amounts to an average tax rate of 19.5 percent. If all personal income were taxed instead, the same revenue could be raised with rates ranging from just 4 percent to 17 percent. That would amount to an average tax rate of just 9 percent—less than half the current effective rate. High effective tax rates required by narrow bases hurt the nation’s economic performance and lower the standard living for all Americans. As the President’s Advisory Panel on Federal Tax Reform prepares its recommendations it should place a high priority on identifying ways to broaden the federal income tax base. (This “Fiscal Fact” is based on the Tax Foundation Special Report No. 135, “Taxing More, Taking Less: How Broadening the Federal Tax Base Can Reduce Income Tax Rates“. For more information, contact the press office: (202) 464-6200.